Posted on February 10, 2019 February 9, 2019 by SherylPosted in FoodTagged jelly, pastry, recipe. I’ve always adored cinnamon-sugar pastry scraps. This clearly is a variation worth trying! This is delightful. I’ve never seen anything like these hearts and love how easy they are to make. Might need to make them this week… say on Thursday? I wish I had one or two right now to go with morning coffee. They’d be perfect with coffee. That’s a great twist on how to use left over pie crust,I always did cinnamon and sugar. I’ll have to give this a try. Might even do a few with cinnamon and sugar shaped to hearts then color the icing to red to drizzle over top. mmm. . . Your tweaks sound absolutely wonderful, and they’d be really pretty with the red icing. What a lovely idea! 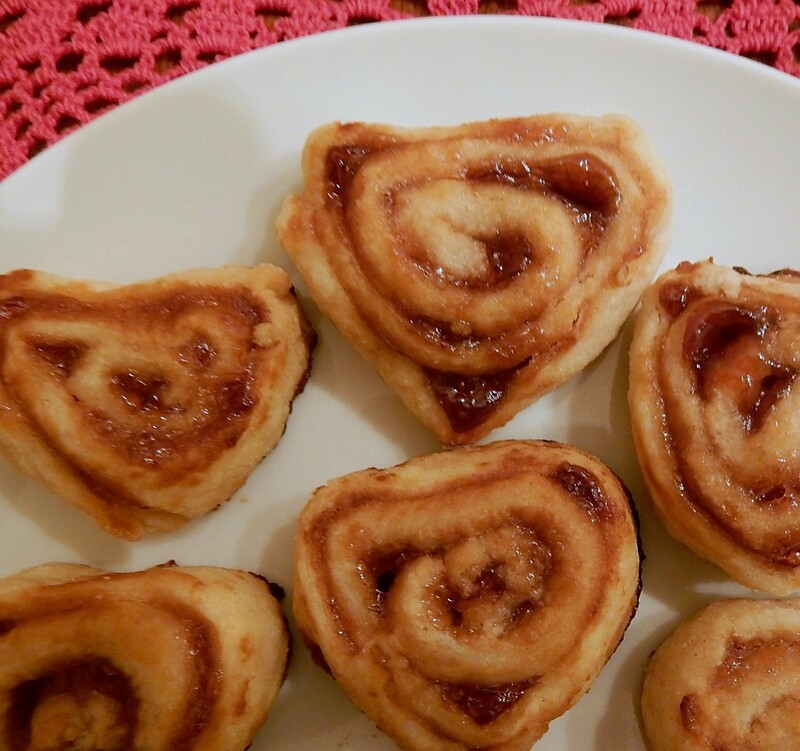 Making Valentine pastry hearts sounds easy and quick. Yes – these are easy and quick to make. Sometimes I’m amazed by the really practical, simple recipes that I find in old cookbooks. Some of today’s recipes are a bit over the top. They always seem to require a trip to the supermarket for some exotic ingredient. No wonder you are so good at picking100-year-old recipes to share! There aren’t many mystery ingredients. I’m still wondering about the taste of chocolate Jell-O from a previous post. I tend to think that chocolate Jell-o wasn’t very tasty. Chocolate Jell-o hasn’t been available for a long time. I don’t think that it was around when I was a child. I’m sure I would remember chocolate Jell-O if I’d had it as a child. There is a huge section in my head reserved for chocolate. You should give them a try. They are fun and easy to make. I had similar thoughts. This such a simple idea – and I can’t figure out why putting jelly on pastry scraps never caught on like cinnamon and sugar did. Yum. I’ve always done this with cinnamon sugar, too, but this looks and sounds perfect for Valentines Day! Sometimes I even just bake pastry scraps “naked” and they still seem to get eaten. This reminds me of something my mom would do for us as children. Cinnamon sugar was our go to filling. Such great memories! My mother also usually put cinnamon and sugar on pastry scraps. Great way to use up leftover pastry as it was always making jam tarts for me growing up. Jam tarts sounds really tasty, too. Those do look tasty ,and so easy to make! Thanks for the recipe! You’re welcome – I think that you’d like them. How clever these are! What is it about the old recipes that make simple so good! Thank you for sharing this! How perfect for Valentine’s Day! Love the old recipe! It’s nice to hear that you like the recipe. I wonder if this would work with a gluten-free pie pastry.